Be the leader of your own journey. – There are far too many capable people who don’t pursue their dreams and goals because they let their fears, or others, talk them out of it. They give up before they even try and simply let life’s river flow them downstream. Choose to be stronger than that. Choose to swim upstream when you have to. Choose to do the things in life that move you. Let others lead small lives. Let others argue over small things. Let others cry over small wounds. Let others leave their future in someone else’s hands. But not YOU. Embrace uncertainty. – Sometimes what you don’t want is exactly what you need. Sometimes what you’re most afraid of doing is the very thing that will set you free. Some of the most incredible chapters in your life won’t have a title you feel comfortable with until much later. Don’t just study it. DO it! – Knowledge combined with intention and action will organize the fulfillment of almost any desire. Yet so many people miss the final step. The action! So pound this into your head: The acquisition of knowledge doesn’t mean you’re growing – growing happens when what you know changes the actions you choose to live by on a daily basis. It’s about learning AND DOING! Put diligent effort into your biggest goals. – Are you willing to spend time for a few years like most people won’t, so you can spend the better part of your life like most people can’t? Think about that for a second. If you want the benefits of something in life, you have to also want the costs. Most people want the reward without the risk. The shine without the grind. But that’s laziness, and laziness does not pay. Effort pays. The time and energy you invest in focused effort is never wasted. So remember… Expecting to win without preparation and hard work is arrogance. Expecting to win because you’ve prepared and worked hard is confidence – and that’s what you need to succeed in the long run. Think you CAN. – Truthfully, if it doesn’t challenge you, it won’t change you. And change breeds growth. So when a goal seems big and a plan looks tough, just begin, push through it for awhile, and soon the next thing you need to do will look possible. Step by step you can get through anything – this is the truth and you have to believe it. In the end, you’re going to succeed because you’re crazy enough to think you can. Respond with the power of your positivity. – Talking about our problems can be an unhealthy addiction. Break the habit and talk about your joys, victories and blessings instead. Envision problems no longer being a problem to you. Envision the frustrations around you no longer frustrating you. Envision a day where you are no longer limited by limited thinking. Envision old obstacles no longer being able to hold you back. Now consider this: Your life is the way it is not because of what happens, but because of how you respond to it. If you can truly envision that the problems are not problems at all, that’s the way it will be. If you can sincerely imagine that the obstacles can’t hold you back, they won’t be able to. Value what money can’t buy. – People who spend all their time trying to make money, spend all their money trying to make time. Don’t do this to yourself. This year, be wealthy in healthy relationships too. Let your presence overpower your fear of judgment. – When you’re in a social situation that’s making you anxious, train yourself to be present without regretting how others once made you feel, or fearing the possibility of future judgment. This is your choice. You CAN change the way you think. For instance, if you were performing life-saving, mouth-to-mouth resuscitation on your mom in public, you’d be 100% focused and present. You wouldn’t be thinking about what bystanders thought of your hair, your body type or the brand of jeans you were wearing. All these inconsequential details would vanish from your consciousness. The intensity of the situation would motivate you to choose not to care about what others think of you. This proves, quite simply, that thinking about what others are thinking about you is YOUR CHOICE. If you’re struggling with any of these points, know that you are not alone. Many of us are right there with you, working hard to feel better, think more clearly, and live a life free of regrets. 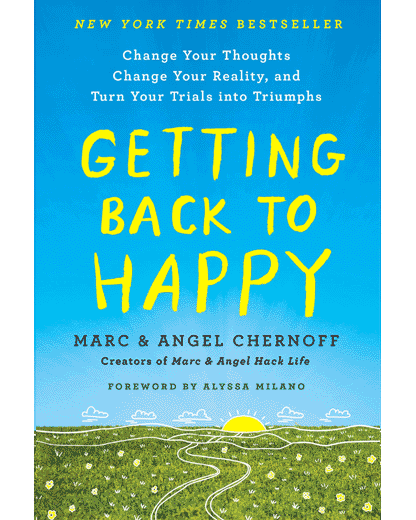 This is precisely why Angel and I wrote our New York Times bestselling book, Getting Back to Happy. It’s filled with short, concise tips on how to do just that. And believe it or not, Angel and I review a lot of our own material on a regular basis too, just to center our minds on these positive principles. The bottom line is that it’s never too late to take a step in the right direction. It’s never too late to become the person you are capable of being. Things can change if you want them to, at any age. Right now you have an opportunity to write yourself a New Year full of peace and free of regret. What else would you add to the list? What do you want to do in the next year that you know you will not regret? Leave a comment below and let us know. Marc (and Angel), your reminders about regret always ring so true to me, and this post is no exception. I know I’ve mentioned this before, but it’s worth mentioning again. After reading parts of your book on regret around this time last year, I called a friend of mine who was batting cancer and dying. I hadn’t phoned her for a while because she was having continuous cancer treatments, which made casual conversation a struggle for us because we knew she has little time. But I also knew I would regret not talking to her, and after I broke the ice, I took it a step further and went to see her every afternoon until she passed away last week. Thank you for motivating me to do so. It’s a choice I will never regret. Like so many others, I’m looking forward to the year ahead. Lots of positive changes from this past year that I want to build upon. Happy New Year! I spent an hour this afternoon walking along a river with my nine year old son. Just the two of us. No agenda, no electronics, no interruptions. It was great. I’ve made a pact with myself that I will do this or something similar with my son at least once a week this whole year, and I know I won’t regret it. Best resolution I’ve ever made. I will never regret letting go of my full time job for part time work so that I can spend time every day with my mom in the last months of her life. They gave her about 6 months, and currently she has another 3 months to go if we’re lucky. These past three months have been an honor and a privilege to be able to help her, to listen to her stories (again! ), to see the love in her eyes and watch the grace that enveloped her as she contemplated her life and that to come. We’ve already grown closer than we had ever been and have developed a genuine appreciation of and gratitude for the women we have become through our cycle of giving and receiving. No amount of money or status or a credit on my resume could replace such a priceless treasure as this experience. And I’m looking forward to all the time we have left together. Marc, as I watched the fireworks last night and welcomed in the new year, I felt privileged and excited about making a fresh start in 2015. A new year brings with it a new beginning. It is a very special time. As you say, it is a priceless opportunity. I’m planning a big year. I’ll be the leader of my own journey. I want to spread my wings and fly. It’s a bit scary, though. A new year and a new chance to get it right! My resolution is to spend more time on self-care. Too often I have given my time away to everyone else. It’s time to reallocate some time just for me. Doing so will help me with a few goals I’ve been putting off for too long. And making progress on these goals is something I won’t regret down the road. Thank you for this post, which I will read many times! Can you explain how #1 and #8 are complementary? How does one know whether to swim upstream or go with the flow? Flowing with life means accepting what is, so you can make effective decisions based on the reality of your circumstances. The key is focus on what you CAN control, rather than worrying about what you can’t control. Speaking figuratively, you can’t control which way a river is flowing, but you can decide how to navigate it. In other words… If you resist the basic notion that the river is flowing in a certain direction, you’ll waste all your time stressing out over the uncontrollable. On the other hand, if you accept that the river is flowing in that direction, you can then make decisions that control how to deal with it. Perhaps you’ll flow downstream for a short while until the current eases up, so you can easily swim to the other side. Or maybe you’ll paddle as hard as you can right now, against the current, to get to the other side ASAP. The decision is yours. And the key is to not defer making the decision. Thanks for this wonderful and timely post. Thank you for every beautiful words and motivation you bring to us. It’s really meaningful to me. Wish you all the best. Happy New Year! Thank you for waking me up, #15 shook me. Thanks Marc for this encouraging post to start the year. I am truly appreciative because I have made up my mind to make this year the best year my life. I have spent my life worrying and becoming frustrating instead of living and I am refusing to allow that to happen anymore. THANK YOU! I have spent the last year struggling and worrying about 2 people that have chosen to leave my life, debating on what I could do to change the situation. I have so much positive in my life that I should spend my time and energy on rather than this negativity and I love that you continually bring this to the forefront of my mind. May God Bless you abundantly in 2015! I used to feel like I had a lot of regrets. Then I learned to go easy on myself. I would add to #9 that we need to be extra kind to people, including ourselves. It’s easier to think that we have done something wrong than it is to think we’ve done everything right. I think sometimes we just have to know that we did the best we could at the time. Another amazing post! There’s been a lot of good-byes in my recent past, and I know it’s been the best thing for me, but still, very painful. I know you’re right about life making room for other people that will be better for me, and that will help me become a better person, but that journey is difficult. It’s so easy to know and see what you are supposed to do, but sometimes so hard to do it. Thank you so much for this post. I have been struggling with a new possible love in my life but as quickly as it started, it seems to be ending and I have just been in a whirlwind of hurt and confusion thinking I’m not worth anything. #15 really hit home, as well as the rest of them, but it helped me to see that it is time to say goodbye and let go. This person has been very bitter toward me and all I have been is loving. This has hurt me but with this hurt, I have been getting stronger. I am making room for the next hello which will be the right person for me to share life with, to be able to share all my love with. For the last 5 weeks I’ve been taking a 3 mile walk every morning. I’m already seeing a positive difference in my energy levels and physical health. Doing this for the rest of the year is my resolution and one I know I won’t regret. Thank you. Your words are a blessing. Have a wonderful New Year. Happy New Year to you and everyone who reads this note! This is a wonderful article. Thank you for posting it. I’d like to tell Sara that I think she is doing precisely the right thing. I lost my mom several years ago. I miss her but I am comforted – even grateful – that we spent an enormous amount of time together. She knew how much I appreciated her. Is there a better gift a child can give to a parent? I believe Sara will have the same. My heart is with her. Thank you for these articles. They LITERALLY keep me going!!!!! Embracing the small moments with my kids and loved ones. Kind of like your #11. It’s too easy to forget the value of making that small effort to show the ones we love that they are the priority in our lives. A phone call, a card, a text (at minimal) a visit, tuning in. Thanks for a wonderful post for the first day of the year! I appreciate you Marc & Angel. Love your blog! I’m never disappointed when reading one of your posts. My plan for this year is to make it a big year, filled with activities and projects. I’m determined that I will not let anything stand in my way. Happy New Year. Am going to make a real effort to like myself more, be more positive, and write positive things down every day. I am going to have a conversation with my sister that has been bothering me for decades. Hopefully, it will turn out well, because I don’t want to lose my only sister. What a great way to start a new year, cleaning up messes from a long time ago. Today is the first new day of my life. Thank you. Looking forward to this, even if scary. How true each point is. But #15 just hit right into the heart. Still finding that difficult. My marriage broke down 2 years ago after husband and I separated. For two years I’ve kept the door open to a possible reconciliation. But in that time, I have built up walls that now imprison me. I don’t want to hurt again by reaching out and taking a risk as it might lead to more pain . But at same time, I don’t want to say goodbye. I’ve been hiding behind the pain and all that has done is not allow me to be the leader of my own journey. I realise that now. How linked some of your points are! Thank you Marc and Angel. Your posts have helped me a lot. Be a blue sky guy. If you don’t ask, they can’t say yes. Don’t let the sun set. “There are far too many capable people who don’t pursue their dreams and goals because they let their fears, or others, talk them out of it. ” This will be my motto for 2015 and driving force to make my online business successful. Marc, thank you for this post. #15 especially hit home. 2014 was a rocky road for me, professionally and personally. I struggled to walk away from someone that was a big part of my life, out of comfort, love…it’s hard to tell now. But now with the fresh year, I strive to start 2015 on a positive note, and finding the courage to say goodbye, when that same person gave me the courage to say hello. Thank you for your inspiring posts, here’s to a new year! If you do not step out and take a risk you will never have an opportunity to reap the rewards. The world needs more leaders and it starts by taking action. Thank you for your inspiring words . After failed relationships and unsuccessful attempts on making them work I have come to understand that it’s time for me. I have given so much of my life to other’s that I never really taken care of my need’s. I finally came to to the point where I had no more to give . My new years resolution is to give my life back to me . I really want this New Year to be a year of change for me. I so often dwell on the past and what could have been or should have been and what if I had not have left my husband and what if I had not run away? I dwell on all the people who have died in the last few years – why didn’t I go and visit my brother on the Saturday before the Sunday he died. I got to him just a moment too late and he was dead. Why do so many good people die? I have been through the most awful periods in my present job and had a terrible time with my line manager trying to suspend me – I dwell on all these things but I am going to try to bury these regrets and move on. My hours are being reduced at work and I have to work out how I can live on 20 hours – but I have the power and the strength to go and apply for a new full time job, despite my age, despite everything. I have overcome so many awful things that many people would not have survived, but I did survive. I have found strength I never knew I had. I will leave negativity behind and only concentrate on the present. I cannot change the past. I cannot change what the future has in store for me. I can live in the moment and enjoy the joy of living in this present moment. I am setting intentions for this new year. New job, new partner, new activities, new past-times. Write my book. Find new friends. Read more. Meditate more. Live more. Look after myself. All these things are possible. This year will be the best year yet. Instead of happy new year…happy new YOU! After several years of reflection and the fire and desire to pursue my passion and improve my quality of life, I have decided to DOWNSIZE and SIMPLIFY my journey. This will require some dramatic changes, and will offer more time to devote to my faith-based life. My future (reachable) goal is to confidently advance to the front lines and devote the best years of my life to my community service. I trust that my faith-based flight path to life will fuel the fires of my heart to enhance the quality of life for myself and others. My burning desire is to serve my heavenly Father with a complete heart, and serve my community by volunteering my time, energy, and an open heart that flows with genuine love, concern, kindness, compassion, empathy, and the Bible’s promises of a peaceful, safe, and fulfilling future. Until then, my anthem for 2015 and beyond……. #15 really hit me hard. I’ve been looking for an answer this past few days and when I read this, I realize that it’s time to let go and to say goodbye no matter how hard it could be. I’ll just have to learn how to let go despite of the emotional pain it would cause. I have to learn to accept the situation, be strong and be able to stand up on my decision to say goodbye….Thank you Marc & Angel for your post. I’m willing to let go, open my heart and stop being afraid if the unknown..
Every time I feel sad, I always read your blog and it inspires me. It helps me a lot!! It makes me realize that there is always a sunshine after the rain!! Thank you!! Love this piece and all the comments. Happy New Year to all – let’s make it a positive one. Everyone, I just wanted to jump back in here and say: THANK YOU! HI, a fresh start for 2015. Thanks for all the great articles you’ve posted. This one is really very timely for all of us. Cheers!!! Thank you very much for all your articles in the past years! I love your website. Happy new year first and foremost! One thing I vow to do for 2015 is to set my goals and more importantly paying attention to the progress that I have made in efforts to reach those goals. I tried setting a few in 2014 and instead of rewarding myself with small accomplishments, I kept both eyes on the big results, which ended up falling flat. So yeah, better start writing those goals now. Wow! Exactly one year ago I learned my husband of fifteen years had been having an affair! 2014 was the absolute most horrible and emotional year of my life! I was on so many anti depressants, sleeping pills, anxiety medicine, constant counseling and absolute horrific MESS! I lost thirty pounds in one month. I went from a size 8 to a size 0! Some how ( I guess an Angel from above)sent me the article 12 Little Habits that Stole Your Happiness last Year through my email! I delete everything! I have never even heard of you! (so sorry) I know the spelling is not correct, but as soon as I saw Marc and Angel my mind rearranged the letters and I saw Carma and Angel! I believed it was a sign so I kept reading! I was so blown away I felt as though you were writing and speaking directly to ME! I couldn’t believe how one article put everything in prospective and I have been searching, looking for answers, wasting so much time from my precious life! #7 and #12 did it for me! I had the best day of my life in a very very long time and from one article you’ve changed my life! It was all right there in black and white! My questions and solutions had been answered right in front of me! I can not begin to tell you how grateful and thankful for you! You seriously have given me a new outlook on life! It’s funny so many people have told me similar things but it was in your delivery that opened up my eyes to reality! Tonight I went on your website to read more and I can’t wait to purchase your book! After reading the article I made three copies for three friends and I said we really should live by this! After reading g the article to my mom, she said I should place one copy in every room and basically attach it to my forehead! I can’t tell you what a complete impact this article has had on me and although I tried so incredibly hard to fight for a marriage that shouldn’t be and today I closed that door with confidence and a sense of relief! I can’t wait to say hello to the rest of my life! I have a lot of living to do to make up for the year I’ve wasted! I am finally going to let go and leave 2014! Thank you, thank you, thank you for helping me to see I have so much living to do! Great blog post ! Thanks. The action part. After the positive thinking comes action. And this one is simple(because we know what needs to be done) but not easy at all. The positive thinking comes first of course, but if we forget the action that must come right after that, we aren’t moving forward. Thank you for the motivation and inspiration! Thank you for this inspiring post! #3 really spoke to me, and I love the imagery. You are a beautiful writer! I am going to study your writing to improve my own. This year I’m going to take a risk …bc I don’t want the regret otherwise! Great post! I would like to live my life without regrets as this negativity will only pull me down. Knowing that we only have one life to live, let us make the most out of it and move forward with each coming day.